Asheville Academy for Girls is a therapeutic boarding school, which is a great alternative to residential treatment center for young girls ages 10-14. We offer an age and gender-specific program that caters to the specific needs of that age group. Our program is not licensed as a residential treatment center, however our team of therapists, educators, and residential staff offer decades of experience and guidance to help your daughter work through her struggles and develop ways to cope with whatever difficulties she is struggling with. Asheville Academy offers a supportive environment in a safe, nurturing campus. Students at Asheville Academy gain confidence, learn how to use coping tools to regulate their emotions and behavior, and have fulfilling experiences that last a lifetime. The clinical program at Asheville Academy utilizes a combination of family, group, individual, and equine assisted therapy to help girls work through their struggles.After girls leave Asheville Academy, they have started on a journey towards healthier and more successful emotional, physical, and academic habits. What are Residential Treatment Centers for Teens? Residential treatment centers for teens are therapeutic programs designed to help teens struggling with mental health difficulties such as ADHD, depression, anxiety, trauma, and attachment issues. These programs are typically inpatient, meaning that students stay there for an extended period of time. Most residential treatment centers for teens offer a variety of therapies catered to the specific needs of each individual child. Therapeutic programming may range from cognitive behavioral therapy, EMDR, and individual therapy to equine assisted therapy and other forms of experiential therapy. Residential treatment centers for teens have a specifically designed milieu that is targeted towards a teen’s treatment needs, gender, and age group. They can be coed or gender specific. Before a treatment plan is formed, residential treatment centers for teens may offer an assessment process in order to create a tailored treatment approach for each student. 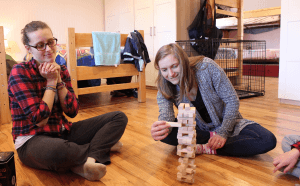 Specifically designed campus: Most residential treatment centers for teens are located on a campus that was strategically created for therapeutic purposes. Because of this, your child will be in an environment that has been created with one goal in mind: to help teens work through their struggles and reach their fullest potential. Clinically intensive programming: Most residential treatment centers have psychiatrists on staff, along with therapists who specialize in the areas of mental health fields geared towards the specific needs of students. These specialties may range from trauma and anxiety to substance use and depression. Age-specific: Residential treatment centers for teens utilize programming designed to help specific age groups. For example, a residential treatment center for young girls still in middle school will not have the same milieu and therapeutic offerings as a residential treatment center for teens who are 16 and 18. This helps personalize the experience for each individual child. Involvement of family: Throughout the entire process of residential treatment centers for teens, the entire family is involved in helping their child get better. Family therapy sessions can help bring the family closer together. Other family involvement activities at residential treatment centers may include parent conferences and workshops, individual parent sessions, and at-home visits later in treatment. An enjoyable experience: Various experiential adventures both of campus and on create a fun environment at residential treatment centers for teens. Some residential treatment centers for teens offer equine assisted therapy, sports, and art classes to help improve confidence in teens while having a bit of fun. Is my teen the best for an alternative to residential treatment centers for teens? Finding the best treatment option for your child is a difficult process. Knowing what solutions may be the most effective for your teen can feel like a rollercoaster of emotions at times. Recently, pop star Kesha entered into a residential treatment facility to treat an eating disorder she was struggling with. Kesha hoped the residential treatment center would help her “learn to love myself again, exactly as I am.” After getting treatment for her mental health struggle, she has made healthier lifestyle changes. Another famous singer who sought treatment at a mental health facility is Demi Lovato. Lovato was also struggling with an eating disorder, as well as self harm issues. Ever since leaving the residential treatment center she entered, she has been a spokesperson for getting treatment for mental health struggles. She has been outspoken about her desire to rid our culture of the stigma of mental health portrayed in the media.